Body hugging curved Flat Profile for comfortable carry. Rugged stainless steel construction. Holds 8 fl. oz. with captive screw cap for secure non-drip storage in rough environment. Insulated carry case completely covers, leaving no metal to show when closed; has velcro fastened flap for ease of canteen removal. 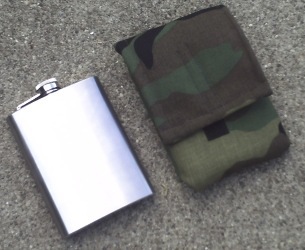 Carry case made of heavy dark green camo Cotton Canvas, with Polyester quilt lining. Case has loop for belt carry. At 6-1/4 inches by 4-1/4 inches by 1-3/4in. does not obstuct swinging of arms on long walks when carried on the belt, and may fit in some large clothing pockets. Do not risk your life saving fluid to plastic! Order at least one for each member. (We have sold these for every purpose from drinking water to secure carry of stove fuel and fire starter fluid, however we do not want to understate the importance of labeling for such multi-purpose use. Our customers use markers on the pouch, and nails or stamps to imprint the label into the stainless. 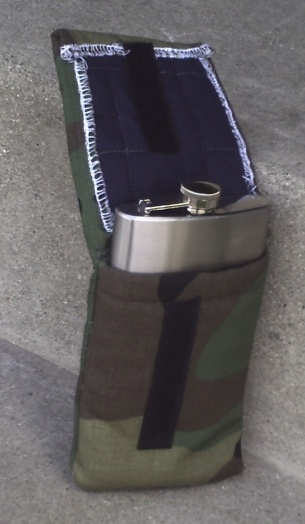 Perhaps the best idea that we have heard on this subject was to keep a Canteen in the medical kit full of high quality grain alcohol for multiple duty. We offer professional embroidery and engraving for group orders; email to FFCService@RichEmporium.com for a quote.